So you want to learn to sew, but you don't want to spend a fortune on a hobby you're not even sure about. Let me show you how to butterfly-stroke your way to a machine worth its weight in gold medals for the price of a little copper. First off, if you get a junky $100 machine from the big chain down the street or (shock) from that big grocery discount store where we buy EVERYTHING, you will hate sewing. Nothing is more demoralizing to a newbie than spending more time troubleshooting your machine than you do actually sewing. (Ask me how I know...) Having a good machine doesn't mean you will never have a problem. Some troubleshooting is born from inexperience, and some from crummy equipment. I can coach you through the former, but just acquiring a decent machine will take care of the latter. Newer machines are much different from their ancient predecessors. If you read the post about stabilizing your machine, you already know that older machines were much more solidly built, often built on a cast iron base and gear driven where new machines are primarily plastic and belt-driven. The result in the change is that newer machines are lighter, but they don't have the power and stability of their ancestors. There's more to it than that, though. Most companies, even some of the gold standard names in the business (Singer, Janome, Pfaff), have begun to outsource part production to that big country that makes all our stuff. That doesn't mean you can't get a well-made new machine, but you can't depend on the brand name anymore to know if you're getting a good product. The bottom line is that -- like most things -- you get what you pay for. Pretty much all cheap machines are, well, CHEAP, no matter which brand name is stamped on the front. It sounds like I'm telling you to get ready to drop a huge wad of cash on a sewing machine, doesn't it? Don't worry, I'm not. :) I'm going to give you strategies for finding a great machine for ANY budget. Not all new machines are dogs; not all old machines are great, either. The major negative of buying an older machine is you can't usually return it, it's not under warranty, you can't always account for how it's been cared for or used, and you may spend some time and money hunting down out-of-production parts. What's your top-end budget? If you have $100 or less, never fear! We can work with that! I got the beauty above for $17 plus the cost of a $58 basic service, including some minor repairs. If you have $300 or more to spend, you can get a reasonable new domestic machine that will be fairly reliable. If you have $500, you can get a new very solid entry-level machine. With a little patience, imagine what a nice used machine you can get with a budget like that! Example: I wanted to spend less than $100 on a second machine for teaching. I wanted the machine to be something reliable, but that I didn't have to feel bad about dragging from class to class. I knew the machine would take a little abuse with all the travel and from beginners. What's your skill level? What type of sewing are you most interested in? Are you piecing quilts? Sewing with vinyl, denim, leather or other heavy duty materials? Are you doing garments? Home dec? The result of this step is really helping you get ready for the next step. It's easy to be lured into paying for fancies, but if all you're doing in the beginning is making covers for throw pillows or piecing cotton for quilts, you don't need a lot of bells and whistles. Example: I knew it could do light duty, sewing for a couple of hours at a time on a variety of fabrics and materials. In addition to identifying what you want to use your machine for, do a little research to find out what's out there in the way of options. Ask your sewing friends what features they like most. Browse the web, including blogs, sale listings and the websites of manufacturers. Visit local dealers to ask about their line of machines. 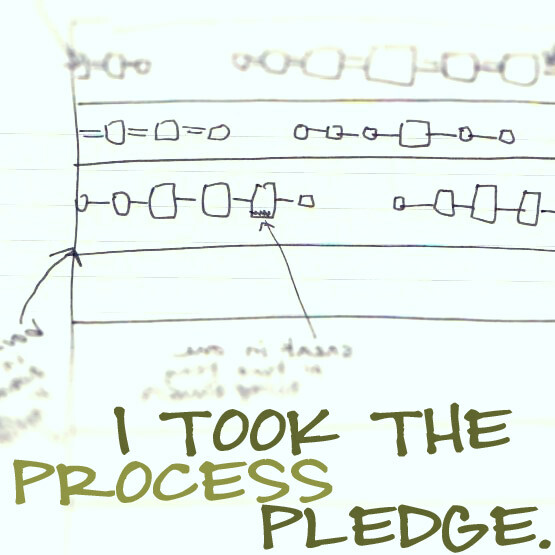 Don't get lured in by the pitch, but let this process give you an idea of the possibilities. That said, don't be afraid to put "nice to haves" on your list. That's the point of the prioritization of features. If you find a smokin' deal on a machine that hits your essentials plus a few of your wants though not all, you've already done the psychological wrangling and know whether to pull the trigger. Likewise, if you find what you know is an amazing deal on a machine with all kinds of bells and whistles, but it's over your budget, you can discipline yourself to walk away. Example: I wanted a reasonably reliable machine with decent reviews, easy-to-find parts, the basic features listed above and a front-load bobbin. (I already have a machine with a top-load bobbin and wanted the opposite to be able to demonstrate both kinds.) The option of heavy duty design would be a plus, since I sometimes can't do heavier duty work on my high-end domestic machine. Half the battle is being prepared to buy when you find that perfect deal. Always have your cash ready to go when you're on the hunt. Your smart phone can be your very best ally on the go. You can do internet searches on the fly both to find machines and to research them. 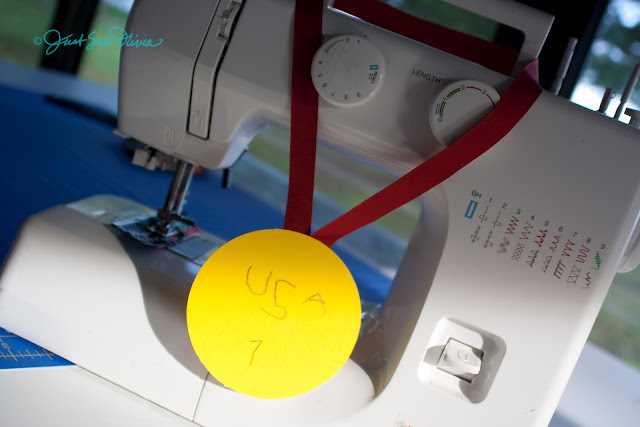 Finally, always have a piece of fabric and a spool of thread with you. It's important to insist on testing a machine, and sometimes the seller doesn't have all the little pieces. Think of this step as a two-stage process: Hunting and gathering. Hunt down the machines, gather information on them. Good research and some legwork will get you through both. 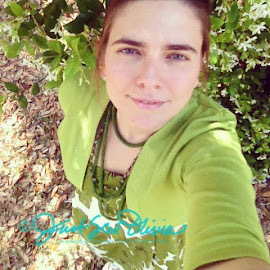 With a smart phone, you can do some of this one the fly, (like at a yard sale). If you don't have a smart phone, just do your research on the computer at home. You can email sellers in advance and ask for model #s if they don't appear in the listing. Do an internet search to determine age, whether the machine has a good reputation and what it's worth. A little advance planning goes a long way. Learn to look for the signs of a well-cared-for machine: Someone who has kept the extras like feet, miscellaneous accessories and the owners manual has also loved and babied her (or his) machine. An owners manual is a major plus if you find an older machine. Even if the seller isn't the original owner and doesn't know anything about the machine, such extras belie care and maintenance. There's no deal better than free. Start with your friends and family and do some asking around. A lot of people came by sewing machines through inheritance or gifting, but never learned to use them. The ones who did learn to sew may have upgraded along the way and never let go of the older machine. (A well-made, fairly well-cared-for machine will last forever. A lot of gems remain hidden in closets, attics and basements.) It never hurts to ask around to see if anyone has a machine they're willing to loan or donate to your cause. Offer to pay for servicing as an incentive for someone who might not be ready to part with Janine, but is willing to loan her out. Thrift stores are CRAWLING with sewing machines, and most of them are older, well-made monsters. They may not be pretty, (or maybe they are -- I'm dying to buy one of these old Singer Rocketeers <drool>), but they're often priced dirt cheap and just need a little love. This is how I found my new teaching machine! I could write an entire tutorial on maximizing your use of Craigslist (CL). Still, I'll do my best to be concise. You can find great deals on all kinds of machines here. Many of them are legit, well-preserved antiques. These aren't the deals you're looking for. (Said in my best Obi-wan voice.) You'll also find some older, solid machines that came from grandma to someone who had no idea how to sew. The holy grail of CL success is the newer machine that someone bought before they realized sewing wasn't for them, or the high-end machine that's been replaced by something even fancier. 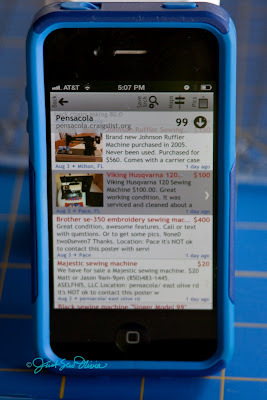 The listings range from the ultra inexpensive, like my teaching machine at $17 (listed at $20), to the very expensive. Still, some of those are great deals, too, if they're within your budget. The secret with CL is to search daily...sometimes twice a day. The junky stuff and very old machines stick around forever, but the great deals go lightning fast. If you don't pay attention, they're gone before you know it. Try some variation, too. If you want to narrow the field, search for brands that you're interested in. I search regularly for Janome, Baby Lock and Bernina, (my general favorites) just to see if there's anything ridiculously good out there. I've even been known to search the CL ads for cities to which I'm about to travel. Driving? A day or two before, search cities on your way. Timing with CL is interesting...the seller may want to see you in an hour, or they may need 2 or 3 days to set up an appointment, but when you do see the machine, you have to be ready to take it on the spot if you want it. Also if you're the one with schedule constraints, prepare yourself to lose the deal if you can't set an appointment right away. CL buyers are flaky, and a smart seller is going to take the first cash buyer that gives them a good offer. 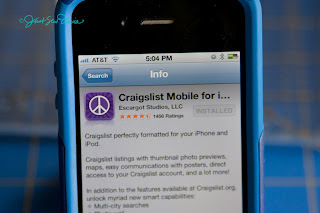 I have a favorite app that makes searching Craigslist much less painful. 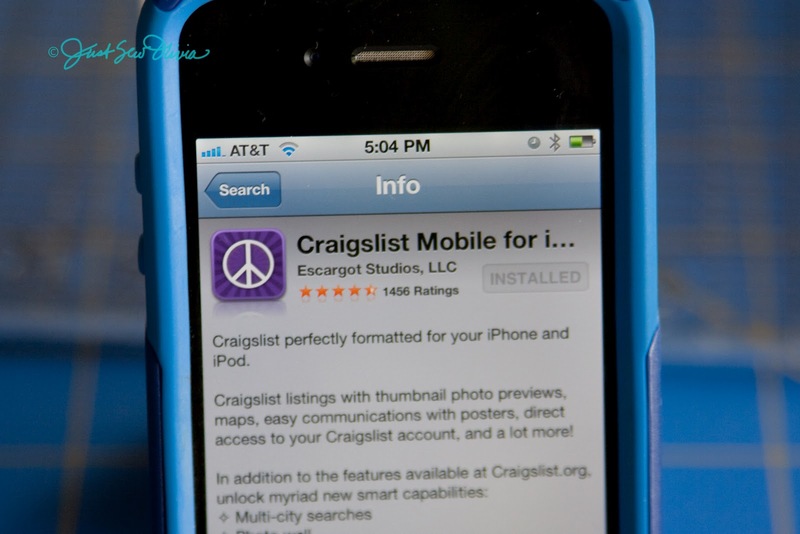 It's called Craigslist Mobile by a company called Escargot Studios, LLC. Here's how the search results look. You can easily search multiple markets at once, it includes thumbnails alongside the listings and you can mark your favorites as well as block others. It's sooooo much more user-friendly than the web version. Although you won't find prices comparable to thrift stores and yard sales, you can find some impressive values at the local dealership. Sewing machine dealers often take machines on trade with new purchases -- like car dealerships. Then they service the traded-in machine and resell it, just like the used car lot. This is the one exception to the servicing rule: If you buy a secondhand machine from a dealer, you don't need to have it serviced. You find some nice older machines and even some very nice new ones. 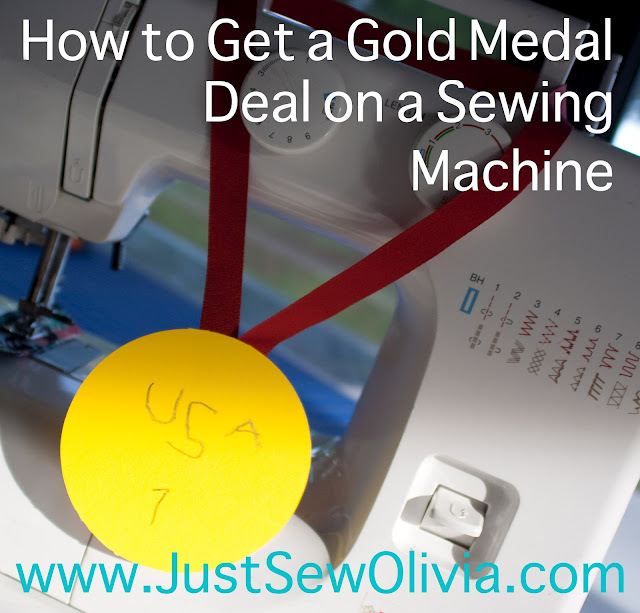 When I got my first sewing machine, I traded it in every year for a higher-end model. The dealership then resold my gently-used, high-end machine at a deep discount. A secondhand dealer purchase usually comes with a short-term warranty, too! If you have a larger budget, like $200 for a first machine, you can get the best value with the least risk here. If you know anything about Kenmore, you know it's Sears' off-brand name for all kinds of products that are identical to the name-brand twin. Our Kenmore frontload washing machine was made by Whirlpool. (Or is it the other way around? I can never remember.) Likewise, imagine my shock when I discovered that you could buy my $1,200 Janome for around $500 at Sears. There were a few minor cosmetic differences in addition to having the Kenmore name stamped on it, but it included all the same stitches and features and even felt the same when it took a stitch. I bought one for my mom, who hated her new Singer (that's right, Singer doesn't walk on water anymore, y'all), and even got an open box discount. All told, it cost us $150. If you're hung up on getting a new machine and you have a decent budget ($300 and up), Sears is a great place to check out. Their machine sales are great, too...big discounts. Just keep an eye out. If you have a nice budget ($350+), look at a dealership, but not a major chain. Locally-owned dealerships often offer fantastic programs like the place where I bought my soulmate machine. I had to buy a new machine, but so long as I traded toward an upgraded model within 1 year of the original purchase, they gave me the full purchase price off towards the next machine. My first machine was $300. The next year I traded it and got a $600 machine for $300. The next year I traded for a $900 unit for $300 and again until I reached my $1,200 machine. I never EVER recommend going into debt for a machine, (Dave Ramsey, Financial Peace all the way), but if you can budget to save $25 a month (as if you were on a payment plan), a step-up trade-in policy like this at a dealership can help you reach your dream machine without going into debt and while always getting to sew on a new machine. Locally owned dealerships can also often offer you prices well below MSRP or may be willing to sell a floor or classroom model at a deep discount. I can't promise that any specific dealer does all these things, but they're not uncommon policies to come across. These machines come with a standard manufacturer's warranty and the dealer will also generally give you a certain degree of instruction, like a free usage lesson, and a reasonable amount of technical support until you get comfortable with your machine. And that, my friend, is worth its weight in gold. If you live in and around Delaware, check out the Delaware Sewing Center...they represent the perfect model of customer service that I mentioned above. That's where I bought my first machine, and they're always delightful to speak with!